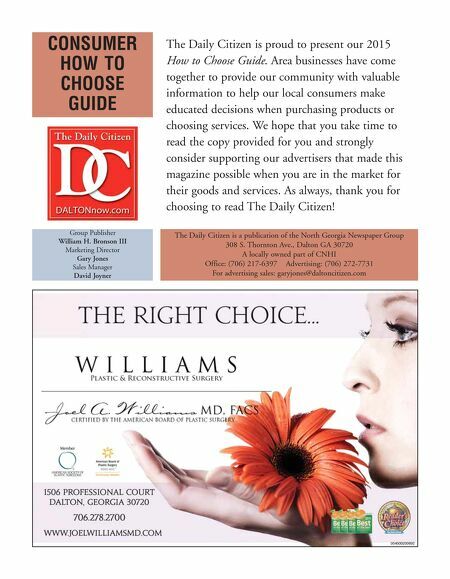 The Daily Citizen ◆ HOW TO CHOOSE GUIDE 2015 3 Once you've decided to explore having cosmetic surgery, the most important deci- sion is choosing the right doctor. With an explosion in new technologies and proce- dures being introduced almost daily, con- sumers are bombarded with options and spend literally hundreds of billions of dol- lars each year pursuing perfection in their own way. Unfortunately there are few safeguards in place to protect consumers as they navigate their way through all these choices. What safeguards are in place to protect consumers? Patients considering cosmetic surgery are often surprised to find out that there really are none. Before the days of physi- cian advertising, the family doctor assumed this role, referring his patients to surgeons which whom he had personal knowledge of their training and quality of results. In order to bypass this protection, it has become commonplace for cosmetic physicians to advertise directly to con- sumers. You have essentially become your own protector. Now ad campaigns are designed to "create" reputation, taking the place of traditional hard work and good results. Surgeons and non-surgeons alike from a variety of backgrounds perform cosmet- ic surgery. Many patients are shocked to learn that a medical license is all that is required to perform surgery and practice medicine, any kind of medicine! That's not to say that any physician can walk into a hospital and perform surgery. Hospitals and outpatient surgery centers spend an enormous amount of energy on credentialing each and every surgeon who performs surgery in their facility. The training and experience of each surgeon is verified and performance monitored on an ongoing basis. Complications are moni- tored and addressed by committees tasked with ensuring quality. There are no such protections in the office surgical suite. You can ask about credentials and experience that the prospective surgeon has with the procedure you are considering, but in the end you are depending upon the integrity of the doctor to give you an honest appraisal of their abilities and limitations. So what else can you do? Questions to answer before scheduling the consultation Do your homework in advance. There are several good websites to start your research. 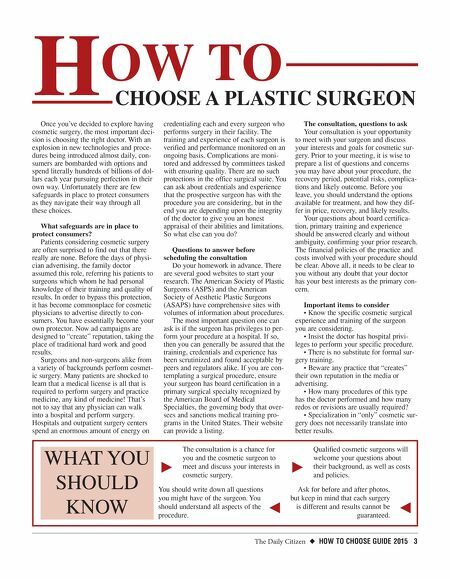 The American Society of Plastic Surgeons (ASPS) and the American Society of Aesthetic Plastic Surgeons (ASAPS) have comprehensive sites with volumes of information about procedures. The most important question one can ask is if the surgeon has privileges to per- form your procedure at a hospital. If so, then you can generally be assured that the training, credentials and experience has been scrutinized and found acceptable by peers and regulators alike. If you are con- templating a surgical procedure, ensure your surgeon has board certification in a primary surgical specialty recognized by the American Board of Medical Specialties, the governing body that over- sees and sanctions medical training pro- grams in the United States. Their website can provide a listing. The consultation, questions to ask Your consultation is your opportunity to meet with your surgeon and discuss your interests and goals for cosmetic sur- gery. Prior to your meeting, it is wise to prepare a list of questions and concerns you may have about your procedure, the recovery period, potential risks, complica- tions and likely outcome. Before you leave, you should understand the options available for treatment, and how they dif- fer in price, recovery, and likely results. Your questions about board certifica- tion, primary training and experience should be answered clearly and without ambiguity, confirming your prior research. The financial policies of the practice and costs involved with your procedure should be clear. Above all, it needs to be clear to you without any doubt that your doctor has your best interests as the primary con- cern. Important items to consider • Know the specific cosmetic surgical experience and training of the surgeon you are considering. • Insist the doctor has hospital privi- leges to perform your specific procedure. • There is no substitute for formal sur- gery training. • Beware any practice that "creates" their own reputation in the media or advertising. • How many procedures of this type has the doctor performed and how many redos or revisions are usually required? • Specialization in "only" cosmetic sur- gery does not necessarily translate into better results. H OW TO CHOOSE A PLASTIC SURGEON WHAT YOU SHOULD KNOW k j The consultation is a chance for you and the cosmetic surgeon to meet and discuss your interests in cosmetic surgery. You should write down all questions you might have of the surgeon. You should understand all aspects of the procedure. k j Qualified cosmetic surgeons will welcome your questions about their background, as well as costs and policies. Ask for before and after photos, but keep in mind that each surgery is different and results cannot be guaranteed.